Oxford Nanopore recently announced that it has attracted a further £100M in funding. 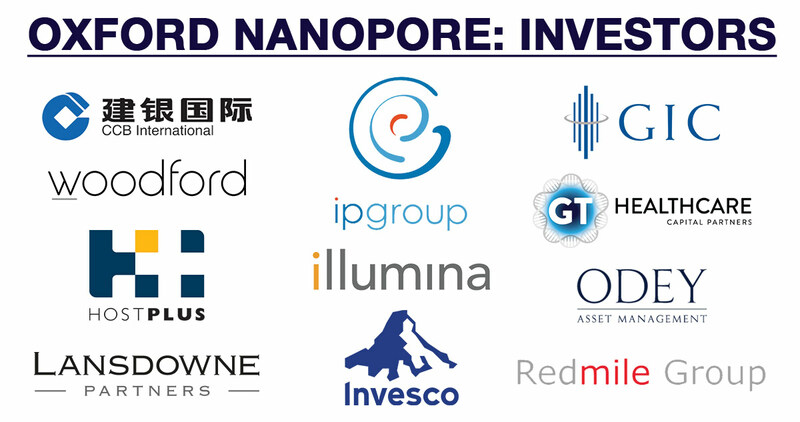 The latest investment round values Oxford Nanopore at £1.5B, with Singapore-based GIC, China Construction Bank International and Australian company Hostplus contributing to the offer. Since 2009, Oxford Nanopore has raised £499M through private placements, highlighting sustained VC and industry interest in the company’s disruptive sequencing technologies. Oxford Nanopore started as an Oxford University spinout, receiving initial seed funding from IP Group in 2005. IP Group remains the company’s largest shareholder with a stake of 18.3%. Oxford Nanopore has stated that the most recent round of funding will be used to build a factory in Oxfordshire that will enable the company to meet the growing demand for its sequencing technologies. Ultimately the company’s success hinges upon the success of the recent launches of MiniION, GridION and PromethION platforms, all of which are in early stages commercially. Company CEO Gordon Sanghera cites that orders for Nanopore’s equipment are trebling every year: in 2017 they were $23.5M and this year are expected to be about $75M. Oxford Nanopore’s pipeline is expanding with new platforms such as SmidgION, the details of which will be revealed at the London Calling meeting in May 2018. One of the most exciting features of the MinION is its compact size and the capacity powered and operated via a laptop. This feature has allowed scientists to create experiments that would previously have been impossible. For instance, instead of collecting samples and couriering them to the sequencing laboratory for analysis, the sequencer can be taken to the samples. This has a number of advantages including faster results, ability to analyse samples such as in situations where there are concerns about the logistic chain or stability of the samples being analysed. Exciting applications include Oxford Nanopore’s role in the surveillance of the West African Ebola. All instruments and consumables necessary to set up a genome surveillance lab were packed into less than 50kg of aircraft baggage and flown to Guinea. Some of the same team responsible for the Ebola study are part of the ZiBRA collaboration which is using MinIONs to carry out surveillance of the Zika virus outbreak in Brazil. Another group evaluated the use of Nanopore sequencing as part of a rapidly deployable laboratory during a 2016 NATO exercise which simulated an outbreak due to a bioterrorism attack. In this case, a MinION was operated inside an inflatable tent in which the team were able to prepare samples, sequence and perform metagenomic analysis to determine the causative agent. Whilst the above could also have been carried out with technology from the competition, the attraction of being able to sequence at source is one that truly has the potential to democratise DNA sequencing based on real time analysis. The game changer in this may well be SmidgION, which a small 128-channel nanopore sequencer that attaches to and is powered by a mobile phone. Oxford Nanopore is not the only player in the nanopore-based sequencing space, with both Roche (Genia) and Hitachi offering competition. However, both companies are not at product launch stage and therefore may be too late to gain a foothold unless technical superiority and/or lower costs can be demonstrated. The key commercial question is whether Oxford Nanopore will successfully take share from Illumina, which currently has at least 80% of the market, generating revenue of $2.75B in 2017 (CAGR 19%). For established labs carrying out pre-existing genomics programmes, assuming all things equal in terms of costs and technical accuracy, it’s unlikely that most will consider changing from a platform and supplier they know and trust. In this regard, Oxford Nanopore’s lab based PromethION may well struggle. However, a platform that offers the ability to ‘sequence DNA whenever and wherever you want to’ is attractive and will find a strong and valuable niche that may well outgrow traditional lab-based sequencing over time.